I worked half day today, OK a bit more than half, so that by the time I grabbed some lunch at Mak's Noodles in Causeway Bay and walked over to Victoria Park it was almost 3pm! And there were lots of people at the Chinese New Year fair! I'd gone last Sunday to take a peek but wish I had more time to check it out then so I wouldn't have to go back. 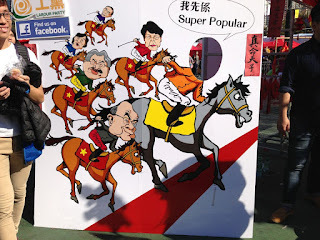 Will you win the horse race for the next chief executive? There were so many people -- not yet to the point where you were squashed like sardines and pushed along by the crowd -- and also it was very warm, making it not so pleasant to be there for too long. 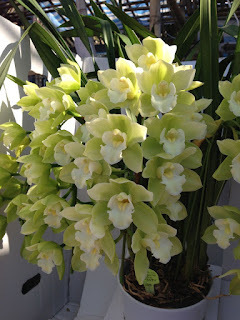 So this year I have to admit I didn't pass by every single stall, but there was quite a lot to see anyway. 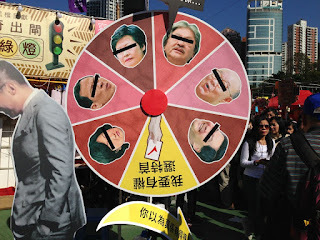 The political parties were out with their caricatures of the four candidates running for Chief Executive in March, while Demosisto led by Joshua Wong Chi-fung had a banner that read "Determine Our Future". Audrey Eu Yuet-mee of the Civic Party was demonstrating her Chinese calligraphy skills. 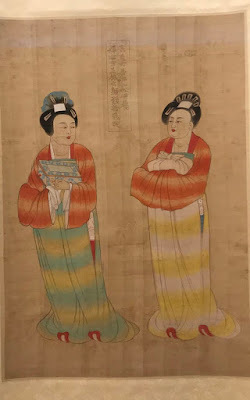 I watched her for a bit and she wrote some English with Chinese on some fai chun, or Chinese couplets which made me wonder if this was a new thing, or her own twist. Or how about spinning the wheel for the next CE? 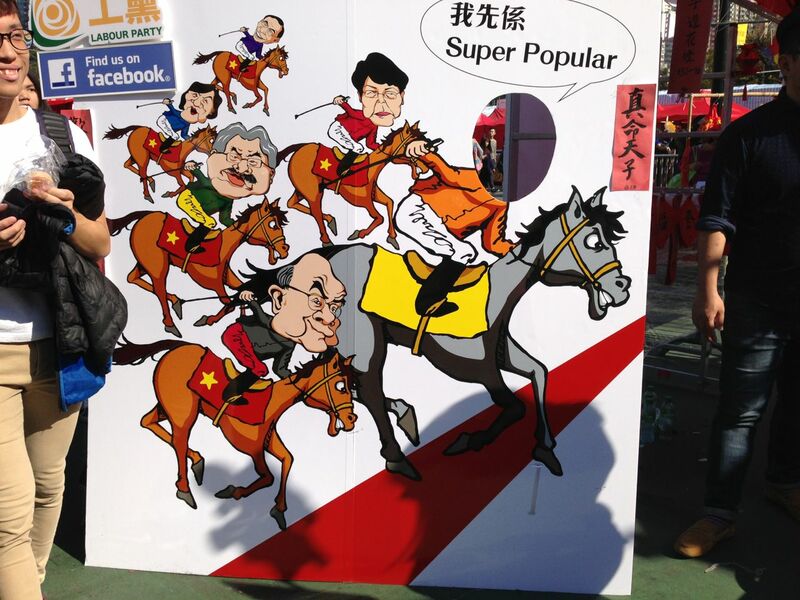 At the stall of the New People's Party, its founder Regina Ip Lau Suk-yee running for CE, there were no customers interested in buying rooster-related merchandise... while Lee Cheuk-yan was trying to get people to have fun by poking their head in a hole where a jockey's head would be first in a horse race with the other CE candidates not far behind. Meanwhile there were many rooster or chicken-themed merchandise to buy. It was disappointing not to find a rooster that looked like Donald Trump. But then again when people were ordering merchandise many months ago, little did they know or think of something like that. Surely a Trump-looking rooster would have been really popular, especially on social media. The fair wasn't all political satire, there were also lots of snacks and puddings for the new year, and of course flowers. 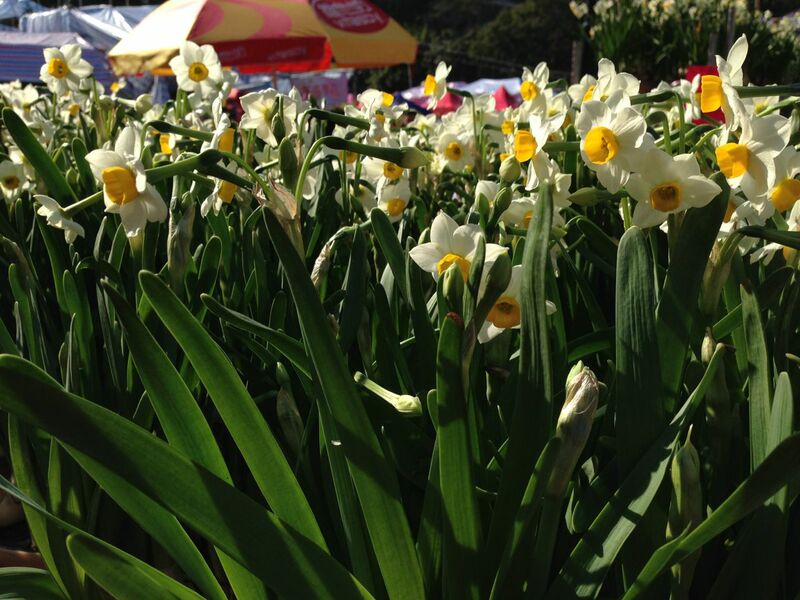 Many narcissus were already in bloom because of the warm weather and their fragrance is intoxicating. One stall sold roses covered in glitter! 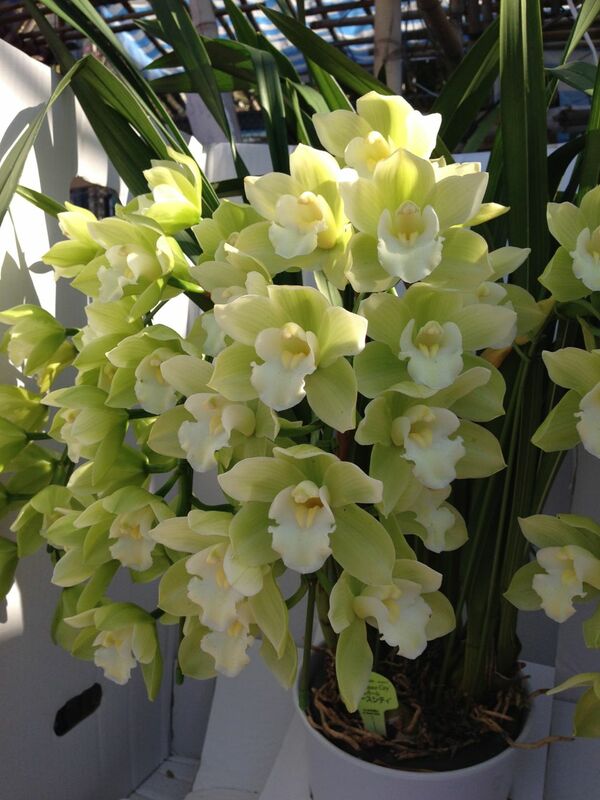 Also the orchids were lovely too -- some very expensive and in the thousands of dollars! Wishing everyone a Happy New Year of the Rooster!